Here's what I've been doing on my jobs since the last week of December. Pruning roses is what we do in SoCal in January into February. If you've been following along you've seen some of the reasons why we prune. If you haven't, we prune to get rid of pests and diseases, to encourage new growth and to make our rose bushes a manageable size. Strip off all the leaves to get rid of most diseases. Just pull down and they come off. 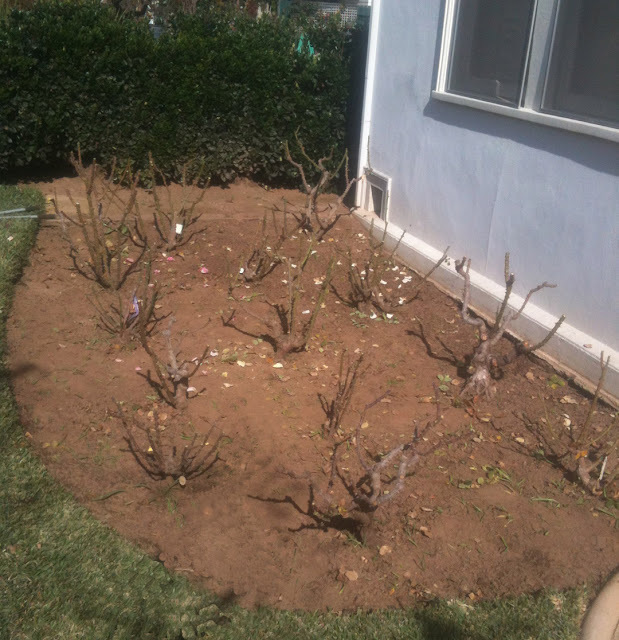 This is what they should sort of look like when you are done pruning depending on the age of the plants. Older really woody plants might not be able to be pruned so low. These are pruned about knee high. I'm not going to give a whole lesson here on how to prune. Stay tuned for my total. Last year I pruned 2065 bushes. I think I'll surpass that this year. Nutrients are stored in the woody canes of a rose, so the larger the plant is, the stronger the plant will be.